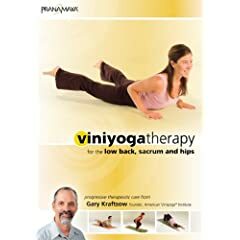 Gary Kraftsow, yoga instructor and founder of Viniyoga Therapy in the United States, has released his first-ever DVD series. As the title suggests, this DVD focuses on issues of the lower body, specifically the lower back, hips, and sacrum (the other DVD in this series focuses on the upper body). These Viniyoga Therapy DVDs differ from other yoga media offerings in that they contain a strong educational component in addition to the practice element. Furthermore, the practices offered are designed for rehabilitation and strengthening, and thus they are more similar in feel to a physical therapy session than to a yoga class. The main menu of this DVD consists of four separate segments: 1) Understanding Back Pain, 2) Technique Workshop, 3) Therapeutic Practices, and 4) Special Features (includes Gary's biography, lecture slides, subtitles, and other resources). The first of these provides a short (22 minute) lecture covering the basics of back pain, including the types and causes of pain. Using a Power Point-type visual aid, Gary presents simple anatomical information and explains how yoga therapy can be beneficial for the treatment of lower back issues. The Technique Workshop provides the opportunity to study individual postures in greater depth. Here Gary offers one-on-one instruction of each pose, providing detailed information about breathing and movement patterns. This section is organized by category (i.e., kneeling poses, standing poses, prone poses, supine poses, and seated poses), but postures can also be accessed individually. Furthermore, during the Therapeutic Practices that follow, an option appears on screen at the start of each pose which allows the viewer to return to the Technique Workshop for review as needed. Lower Back Therapy (23 minutes). Gary recommends that you begin here, as this is the most gentle practice. The postures are performed entirely on the floor and provide very mild stretching of the lower back area. Hip Therapy (31 minutes). This practice, while still gentle and centered on floor postures, focuses more on the hips. Unlike more traditional hip-opening sequences found in other yoga practices, the goal here is to stretch the hips from four perspectives (front, back, and each side). Strength and Stability (32 minutes). This practice is the only one on the DVD to contain standing postures, and thus the intensity level is slightly higher than the other two. Gary notes that it is designed to build long-term health and fitness in the low back, sacrum, and hips. The practices feature a single student working on a mat against a rather sparse white set, with Gary providing instruction via voiceover. Each practice begins with basic breathing and lengthening in a seated position and ends with savasana (relaxation pose; Gary encourages the viewer to remain here as long as is comfortable). Most people are likely to find the practices rather dry--Gary's voice is a big monotone and repetitive, and there's little "fun factor" here. However, these are therapeutic in nature, and as such, they are largely effective. Although I personally didn't get much out of the first two practices--mainly because the low back and hips aren't a problem area for me--I was pleasantly surprised by the third, as it nicely stretched out not only my lower back but also my upper back, shoulders, and entire torso. This DVD would be useful for virtually anyone who is at risk for lower back issues, from those who work at physical labor to those with more chronic conditions. I definitely recommend Viniyoga Therapy for Lower Back, Hips, and Sacrum as an excellent tool for alleviating pain and promoting health in the entire lower back area.